You’ve seen the fruit and vegetable slicing. You may have also seen the pizza, meat, cherry, bugs and fireworks slicing BUT still, there is one thing missing…. What? 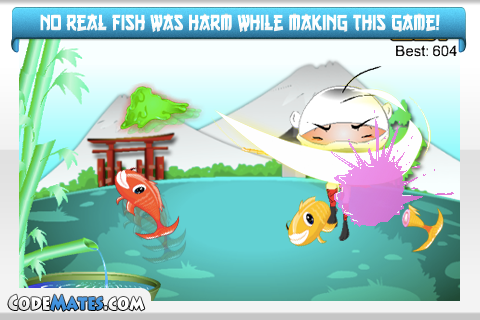 In this adorable, fun, messy, exciting, squishy, and entertaining game you will guide our hero to slice fish for lunch (Disclaimer: no “real” fish was harm during the making of this app). Aaron, the Kid Ninja is continuing his quest to be the Super Ninja. 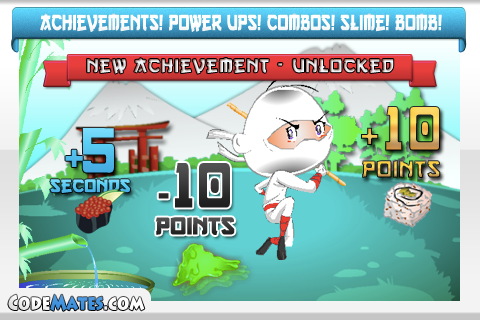 With Master Wasabi at his side, it is only a matter of time for him to reach his goal. Let us continue to help Aaron hone his skills and make his goal within his reach! – Slice! Slice! Slice! Can it be any easier? Oh, avoid the slime and bomb. 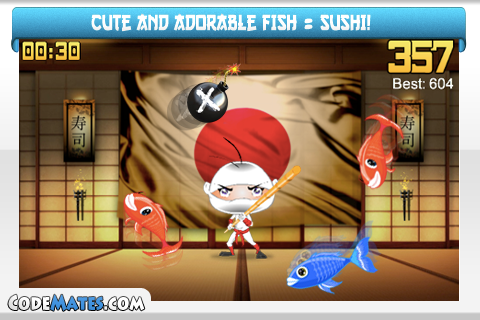 – 2 game modes (Sushi-In-A-Minute and Combo Master) and another on the way! 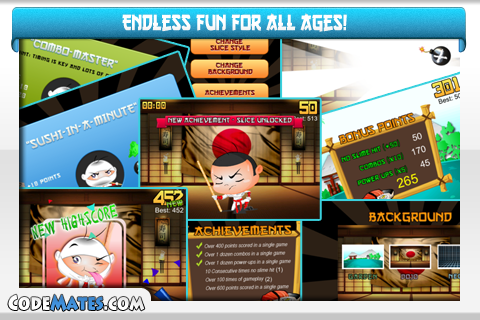 – Another highly addictive game! Kid Ninja will run on lower end devices but we highly recommend to play this game on Arm7 devices (iPhone 3GS, iPod Touch 3rd gen) and above for best experience.